Because the Museum of Contemporary Art Chicago often has a special exhibition, such as the really wonderful look at artist Enrico David in “Gradations of Slow Release (up through March 10, 2019), tt’s arguably easy to forget that the MCA has its own massive collection of works that would likely have permanent wall space in a larger building. 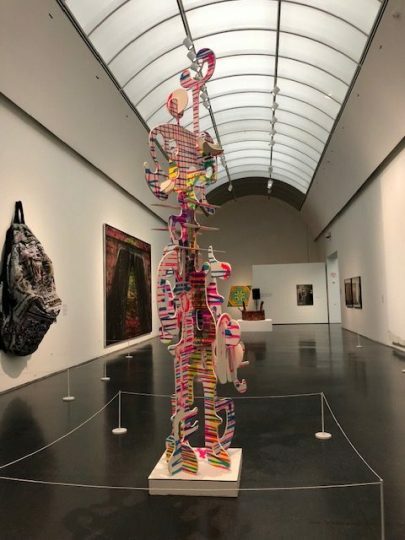 Therefore it’s no surprise that a new show, “West by Midwest,” primarily made up of works in the museum’s collection, is a way to give some of the fine sculptures, paintings, prints and photographs not recently on public view pride of place up on the fourth floor’s special exhibition space. The new exhibit has an interesting theme. The works are by Midwest artists who either moved to the West Coast to study and then stayed or temporarily went there to exhibit. “I thought it was time to do an exhibit based on our own holdings,” MCA Chief Curator Michael Darlin said at the show’s opening Nov. 16. While going through the collection, some artists who had migrated to California, though at different times, particularly caught his attention. “I said, ‘Hey wait a second. These are all from the Midwest,’ ” Darling explained. Organized by Charlotte Ickes, a postdoctoral Curatorial Fellow, with Darling, the artists range from Larry Bell and Judy Chicago to Gladys Nilsson and Charles White, along with about 60 more artists from the 1960s through the second decade of the 21st century. The exhibition is divided into five sections according to artists that overlap each other in either approach or within their circles of friends. Some of the artists went to the same California art schools or collaborated. Thus the exhibit not only showcases some of their work, it also shows artists as beings who interact politically, socially and artistically. Details: “West by Midwest” is at the Museum of Contemporary Art Chicago, 220 E. Chicago Ave. through Jan. 27, 2019. For admission hours and other information call (312-280-2660 and visit MCA Chicago.